244 pages | 10 B/W Illus. The family is an important site for the transmission of knowledge and cultural values. Amidst claims that young people are failing to follow health advice, dropping out of sport and at risk of an ever-expanding list of lifestyle diseases, families have become the target of government interventions. 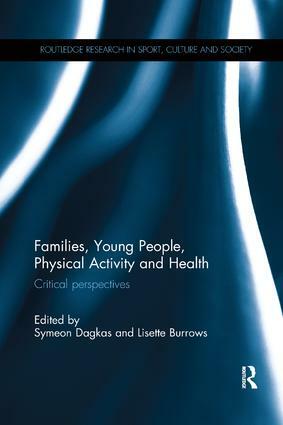 This book is the first to offer critical sociological perspectives on how families do and do not function as a pedagogical site for health education, sport and physical activity practices. how family pedagogies may influence health education, sport and physical activity now and in the future. This book is essential reading for anyone with an interest in health, physical education, health education, family studies, sport pedagogy or the sociology of sport and exercise. Symeon Dagkas is a Reader in Youth Sport and Physical Activity at the University of East London, UK, and an Honorary Senior Research Fellow in the School of Social Policy at the University of Birmingham, UK. He is currently interested in research examining intersections of race, ethnicity, culture and social class of young people and their families in relation to health and well being, sport (PE) and physical activity. Symeon is the editor of another Routledge book, Inclusion and Exclusion through Youth Sport. Lisette Burrows is an Associate Professor in Physical Education Pedagogy at the School of Physical Education, University of Otago, New Zealand, where she has taught for over 20 years. Her research is primarily focused on understanding the place and meaning of health and physical culture in young people’s lives. Health and Physical Education curriculum, issues around inclusion of young people with disabilities and critical obesity work are also part of her research agenda. She predominantly draws on post-structural theoretical resources in her writing and teaching.